9 Preset Cooking Functions. The preset cooking functions allow you to enjoy your favorite meals with the push of a button. Safety Pressure Release Valve. This quick pressure release valve automatically releases pressure from inside the pressure cooker when the pressure levels become too high. This safety feature protects not only you but also your food! Stainless Steel Construction. Because it is crafted from premium stainless steel, you can rest assured that you will be able to use this pressure cooker for many years to come. LED Display. The bright and generously sized LED display makes it simple to read the menus and make the right selections. Dishwasher Safe. The cooking insert for this pressure cooker is dishwasher safe which cuts down on cleanup following your meal. Timed Cooking. These settings are great for when you choose to brown or steam your food, or you want a delayed start to the cooking process. Crafting delicious and nutritious meals becomes simple with the Farberware 7 in 1 Programmable Pressure Cooker (see best price). This small, but powerful, kitchen appliance harnesses the power of steam to cook and brown foods quickly. The steam also helps to seal in the moisture and flavor of the ingredients. This particular model offers low and high-temperature settings, as well as a “warm” setting–making it simple to prepare your favorite foods. These Farberware pressure cooker models were designed with safety features in mind as well. These kitchen appliances include a self-locking lid to form a tight seal around the rim of the pot. There is also a pressure release valve that will automatically release steam as required. The release valve also allows you to release steam manually when you pressure cook. The oversized carrying handles make it simple to carry the pot around without having to worry about accidentally burning yourself. One of the standout features of this pressure cooker is that it is crafted from premium stainless steel to ensure its durability. There are nine preset cooking functions to streamline and simplify the cooking process, and the oversized LED display is simple to read–even in the dark. Also noteworthy is the fact that the cooking pot is dishwasher safe, which makes cleanup a breeze. The cooking pot does have a nonstick coating. While this may seem like a good pressure cooker, like with any other kitchen appliances, you may find that you run into a few issues along the way. There is no minimum liquid requirement for this pressure cooker, but it is still recommended to use at least one and a half cups of liquid or water. This is standard for most pressure cookers. The liquid is needed to produce the steam and pressure that will cook the food. The slow cook setting for this pressure cooker is also a lot like the low temperature setting for a slow cooker. Therefore, you may need to check the recipe you are using and bring the liquid to a boil using the sauté setting and then switch to the slow cook method on the pressure cooker. If you receive an E1 or E2 error code, it may mean that there is a problem with the bottom sensor. In this case, unplug the pressure cooker, let the device cool, and then restart it to see if the error code clears. If the device begins to overheat, you may see a C1 error code. If this happens, immediately unplug the pressure cooker, let it cook, and then restart it to clear the code and see if the problem goes away. Reviewers seem divided on how to feel about the Farberware 7 In 1 Programmable Pressure Cooker. Either you love it, or you hate it. There is no in between. Upon opening the unit, I have to say that it does create a striking first impression. It has a sleek, modern design and stands about 13 inches tall. It weighs a little over 12 pounds, which is lighter than most other comparable models, so it’s nice to be able to move it around without too much of a struggle. I do like the fact that this all-in-one appliance can be used for multiple things. Not only can it be used as a pressure cooker, but also as a slow cooker and a steamer. It would have been nice if the user’s manual had come with some recipe suggestions, but it’s not necessary. Many consumers have struggled with a lack of information in the user’s manual and figuring out how to use it as a slow cooker is often a matter of trial and error. It was nice to see that the unit does come with a stainless steel steaming rack, so that is one less accessory that must be purchased. The Farberware 7 In 1 Programmable Pressure Cooker does its job well, but it does have its quirks. For example, the nine preset functions are handy, but I wish it would tell you what the pressure levels are for each just in case you wanted to cook something that is not listed in the owner’s manual. A lot of my recipes require cooking with low-pressure levels, but it’s difficult to figure out which preset functions correspond to low pressure — because of this, cooking with this Farberware model can be a bit of a guessing game. For that reason, I wouldn’t recommend this model to anyone who has never used a pressure cooker/slow cooker before. With all of that being said, it produces delicious food. After getting home from the office or corralling the kids, the last thing you want to do is spend hours slaving over a hot oven to prepare dinner. Overall, your diet will be healthier when you cook with this appliance. 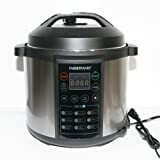 If you want to follow a healthy diet but find it difficult to do with all of the demands on your time, the Farberware Pressure Cooker will put you on the right path. It has an affordable price point which is great for those who don’t want to spend hundreds of dollars on a higher end model. It only has one pot that needs to be cleaned but it can easily be put into the dishwasher, and your food will be ready in a matter of minutes. What more could you ask for? Make sure you have the steam valve rotated all the way to the back. The manual says “clockwise”, but it’s actually counter-clockwise to seal it. if you have it on VENT, it will never pressurize. at least you got an instruction book with yours , mine didn’t have nothing in the box , trying to contact company to get one . Not worth going after the books, go online and find suggestions for operating and cooking. I found manual and recipe book for this cooker online. Yikes! I would definitely contact the manufacturer. The FW-09 setting is for browning meat only. After browning meat, turn unit off and twist the pressure knob on top to close; then set to setting 05 for steak/meat and 06 for chicken and then push start. You cannot use a can of mushroom soup to act as a liquid to produce steam. Pressurized STEAM is how the pressure cooker cooks food. Next time, use 1.5 cups of WATER. You should brown the roast first, set aside, use the water to deglaze the bottom of the pot, add the rack (upright or upside down), add the roast, put the can of mushroom soup on top of the roast (DO NOT STIR it into the water), select P05 and change the time to 90 minutes. When it is finished cooking, you can stir it and leave it open and select P09 to let excess moisture boil off, but you must keep an eye on it so it doesn’t burn the sauce. Hope this helps. Loved this product so much I bought one for my beach house! Healthy food in rapid cook time! Does the Farber 7 in 1 digital pc utilize high and low pressure settings? If so, which menu options use high and which use low? No hi/lo pressure settings. Just high pressure. It does have high and low TEMP settings. The P01 is SLOW COOK and is a low temp setting; no pressure involved. The P09 is for searing and is an high temp setting with a time that is preset and unchangeable. P09 only works with lid off on some early models. my cooker had NO INSTRUCTION MANUAL included , although it says it does on the outside of carton please tell me how to find a booklet on line so I may begin using today. Good luck with finding a manual. However, you can get lots of help from other users by going to the Farberware 7 in 1 Facebook page. I purchase my Farberware 7-in-1- Programmable Pressure Cooker on Friday, December 1, 2017. I have cooked a roast in it on Monday, December 4, 2017. Not to sure if I cooked my roast correctly. I put it in at 11 am and wanted to delay the time for it to start and really didn’t understand how to delay the starting. Supper will be after I get home from work after 6:00pm. I bought a 7 in 1 programmable pressure cooker and there was no instruction manual. Where can I get one? I just took my 7-1 farberware out of the box. Read all directions, only beeped when i unpluged, never will quit flashing —- in blue , wwill not let me program it at all. No other sounds at al. Help please. Thank u. The pressure cooker comes with a rack. Do I use that inside the pressure cooker or not? I LOVE my 7 in 1 ! Have made soups, stews, chili (no need to cook the meat before putting ingredients in cooker), pork and beef roasts, and more. I use it about twice a week. I got mine as a gift but very sad there isn’t cooking instructions like a small cook book telling me how to use it I tried a few recipes and burnt beans by not having enough liquid in the pot How do I get a cook book????? Hard to set timer. Has to cook meats longer than in regular utensil. Very disappointed. I absolutely love my Farberware 7 in 1 pressure cooker. Now I wish I could find more recipes for vegan cooking. I use a lot of dry beans to cook with. My 81 yr old mother has always loved her stovetop pressure cooker. When her last one broke, she said maybe she should not replace it b/c she is getting scared of it, and she likes the idea of an electric pressure cooker. Biggest complaint on this Farberware is poor instruction manual. My mother is not tech savvy & cannot google things, but can you recommend something I can print out for her to give her the basics on what settings to use to get started on her new Farberware electric pressure cooker? Any help for a newbie at age 81 would be appreciated! I love mine. However, for the past two and a half years I’ve been using a cheap one from Aldi that finally died. The Aldi one came with few instructions and only a couple recipes, so it was a real guessing game. Sooo….from past experience and such, I have been able to figure it out pretty quickly. I’ll start writing down my recipes to share. The first thing i did with it, was to put the ingredients for the sauce, frozen chicken breast tenderloins, frozen chopped broccoli and vegetti strings of zucchini, add some salt and pepper. I pressed 6 for chicken, pressed the plus several times to set it to 40 minutes since most of the ingredients were frozen instead of the default of 20. Walk away for 40 minutes. Then I went back and started the pasta to cook. It must have only taken about 10 minutes or so to come up to pressure, because it ended the cycle before the pasta water came to a full boil after adding the pasta. So, I turned the valve and let the steam pressure blow off. Be careful to keep your hand out from over the valve, it blows straight up the middle. I took off the lid, added the cornstarch water to thicken and set it to 9, brown sear. That was plenty hot enough to thicken up. Help, the Manuel is worthless! How many minutes is each P.O.? Doesn’t mention any minutes in minutes form. nice, but would of like more everyday recipes, knee to know the different setting that you have to go through. How can you tell if slow cooker is on low or high? can you cook acorn squash in the 7 in 1 ?? Can you buy gaskets for this cooker.? How can I decide how long to cook something? I was looking for a programmable slow cooker when I purchased this. I am still learning how to use my Farberware 7 in 1. Everything seems to be written for the Pressure Cooker function and not so much for the Slow Cooker. I hope I did not purchase the wrong machine? Help I need a manual on how to use it , Set up and everything , Nothing in the box. I got the 6 quart one. Can you use this like a crock pot? Since my Model WM80 is preset. How do I add time to the preset functions? I purchased this version of the Electric Pressure Cooker and have used it a few times. I love it, but need some help when using it as a slow cooker. Many slow cooker recipes allow the consumer to use a high or low setting, depending on how long the meal will slow cook for. I want to make some pulled pork in a slow cook setting, but the recipe calls for 4hrs on high or 8 hrs on low. When using the slow cook setting on this appliance, what temperature, equivalent to traditional slow cookers, does this appliance offer? How do I cook pasta in it, not sure which setting to use? Can’t find a manual button. First, if your cooker did not come with an instruction booklet, don’t worry about it. It wouldn’t help you much anyway. Use YouTube to figure out how to use the cooker. Second, after a month of use, I am no longer am able to set the cooking times manually. I have to use the pre-set times exclusively. The cooker uses a high pressure setting only; you are not able to switch to a low pressure setting. The food tastes wonderful, but you have to get to success with the cooker through trial and error. Blogs like this one and YouTube videos are helpful to find solutions to problems that the company does not help you with. I even have the instruction manual and cannot figure out how to use time cooking myself. I don’t want to use the preset with some things (artichoke for example) because I cannot tell how long it is cooking. ANYONE? How do you do it? The “directions” and instruction manual are the most useless I have ever encountered in any type of appliance or tool! we bought this unit at walmart. brought it home and had a huge dent in the side. Took it back, got another one and its missing a part. we live 40 miles from a walmart. 80 miles round trip. taking this one back too. reading the directions for use, gotta be a scientist to figure it out.. taking this one back and getting our money back. 160 miles dealing with this product. How do you suggest I steam vegetables? Hi, Melissa! Thanks for asking! The main thing to keep in mind is that it doesn’t take long! I pressure-cooked corn on the cob last night for the first time! 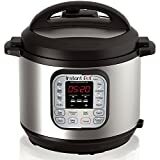 I used my 3-quart Instant Pot Duo Mini (which I love for its small size). I was able to put six ears of corn (broken in halves, so 12) into the Instant Pot Duo Mini and it was FULL. I put in 2 cups of water, even tho 1 cup of liquid is the minimum required. I sprinkled just a bit of sea salt. I pushed the PRESSURE COOK key then adjusted the timer for 15 minutes using the +/- keys. The PRESSURE LEVEL defaults to Normal, and I left it there. I made sure the Steam Release Handle on top was set to SEALING. It was tender, full of flavor, and didn’t have that water-logged taste of corn cooked in a full pot of water! I have found that for most fresh veggies, 15 minutes is the max needed. The smaller the veggie pieces, the faster they will cook. Also, the smaller the quantity of veggies in the pot, the less time you need to pressure cook. If you have just a couple of inches of veggies in the bottom of the pot, you certainly wouldn’t need 15 minutes. Keep in mind that some veggies are thick (potatoes) and some are naturally thinner/smaller pieces (corn not on the cob, green beans, broccoli, etc.). I cooked Baked Potatoes (Pressure-Cooked Potatoes? It doesn’t have the same ring!) twice in the past week in my 3-quart Instant Pot. No foil wrap, just washed the potatoes, put the metal rack on the bottom of the inner pot, stacked in the potatoes, drizzled a little olive oil over them, and sprinkled some sea salt. I cooked 7 medium-sized whole potatoes in about 20 minutes (again, it was FULL so I wanted to make sure they cooked long enough to get them all soft inside). If I were cooking just a few, I would cook them less time, probably 7 minutes or so. I could go on and on, but I hope this has helped you get an idea of how to steam veggies — just make sure you have 1-2 cups of water, the veggies, any spices, then seal and pressure-cook for about 5-15 minutes, depending on the veggie and the quantity of product in the pressure cooker. Let me know how it goes! Just bought the 7in 1 pressure cooker. Instructions are not clear. Wher does the cooking stand go? does it go legs down and force it on or where? When you did the baked potatoes on the rack, how much water do you add to bottom? Usually about a cup of water is all you need, unless you want the water to become part of what you’re cooking. A big (8-quart+) cooker might need more, maybe 2 cups. When using the 8-quart, I like the water to at least cover the bottom of the inner pot and it generally takes 2 cups. With my 6-quart or smaller, 1 cup is sufficient. If you’re using a recipe that contains a water-based broth (chicken broth, for example) and you’re going to have 1+ cups of it in your pot, then I wouldn’t add another cup of water. But if you’re cooking something with tomato sauce, then you do need to add that cup of water. I’ve had some sticky messes with cooking tomato sauce when I didn’t add water! Live and learn! I always add at least 1 cup of water to anything that is going to be on the elevated rack (eggs, veggies, potatoes, etc.). In my smaller models (6 qts and less), then 1 cup covers the bottom of the inner pot nicely. With my 8-quart model, I add 2 cups of water. Can you make popcorn in this pressure cooker? Thank you. I haven’t done it but yes you should be able to. I have had my for almost two years &I love it I have an old cooker but this surpass it the old one. Some recipes call for “manual” settings but I dont see where the pot has that option. Am I missing something? I received a used 7-in-1 6qt. programmable pressure cooker from a friend but it is missing the operation/recipe booklet and I need to know how I can get one or instructions on how to use it. i am excited to buy this Farberware 7 in 1 pressure cooker, this month. Thanks for this detailed review, i am going to buy this 1. Oh, Adam… I just have to smile — thanks for your honesty — but I have to say that I haven’t found any appliance in the kitchen that doesn’t make a mess or “ruin food” at some time, at some point, with some recipe. In the years since I’ve been using the modern pressure cooker appliances, I have had FAR LESS messes than I ever had with stovetop or oven cooking, though, so that’s why I’m a big fan of modern pressure cookers! And modern PCs are so insanely faster than Crock Pots or Slow Cookers! Hope you’ve given your PC a try with something easy (do a search for one of the zillions of “Easy Pressure Cooker Recipes” online! Find something that uses ingredients you already have!) — and discovered that there’s good food waiting on the other side for you! I just finished pressure cooking 11 eggs in my farberware 7-1 on program 8 with 1 cup of water for 5 min. Let them set for 5 min. Released the steam, took them from the pot and put them in a bowl with cold tap water to cover for 5 min. Tapped on the counter and rolled. Easy cook, easy peal. I got the idea from youtube, but they were using instapots with high temperatures. Mine does not have that , so I just had to guess. They came out great. Hooray for boiled eggs! Don’t you just LOVE pressure-cooked eggs?! I have found that if I stick with about 5 minutes on whatever pressure cooker I use, then my boiled eggs turn out fab. The low/medium/high pressure doesn’t seem to matter. I am a big fan of the manual setting on Instant Pots b/c it gives me lots of control. But with PCs with presets, I pay attention to the time of the setting more than the pressure level. This is my go-to angle on simple recipes (soups, veggies, etc.). 😉 Enjoy your 7-in-1! I have a similar model but do not have the instruction manual. I would love to contact Elizabeth Nitz and get her input as well, but cannot find her contact information. Hi, Nancy! Without knowing your specific model, I can’t say exactly where to get the instruction manual — but I have found that if you go to the company’s website, usually look under something like RESOURCES then you have a good chance of finding the digital version of the instruction manual. For example, at http://www.instantpot.com, I clicked RESOURCES then a drop-down menu shows ENGLISH MANUALS. If that doesn’t work at your model’s site, then certainly try the CONTACT US option and give them a call on a toll-free number. Last ditch effort — type into your web browser: “Instruction Manual for _______” (put in your model name) and see what comes up. I have found several missing manuals that way! Best of luck! I would like to get a recipe book for this product with more than the few that came with it. Is that possible. ?